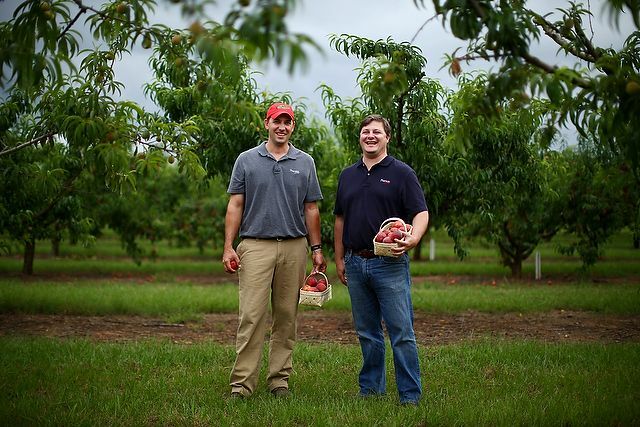 Like the four generations before them, Lawton Pearson ('99) & Will McGehee ('98) have put down roots at Pearson Farm. Fort Valley, Georgia — The big blue pickup truck rocks as Lawton Pearson (’99) expertly navigates between rows of lush peach trees that, in early June, are heavy with fruit. He slowly makes his way down the narrow aisles, right hand on the wheel and left arm out the window, plucking the occasional peach that has been dinged in a recent hailstorm or trying to catch a falling fruit inadvertently “harvested” by the truck’s side mirror. His cellphone rings and he gives a succinct order: “Pick Shaw.” It rings again, and this time the conversation is in Spanish. His keen farmer’s eye spots a plump beauty, ripe for the picking, and he pops it straight into his mouth. “I would rather eat this than anything else,” Lawton says, savoring the rosy pink fruit and naturally sweet juice trickling down his hand. On the console he lines up three ripe peaches, identical except for their diameter, and pulls out measuring rings. “I can’t sell small peaches,” he says of the 1 3/4-inch specimen. 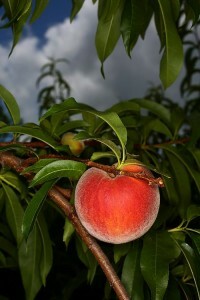 The middle peach, about 2 inches, will sell if consumers find no larger ones available. The largest peach comes in at 2 3/4 inches. “That’s the perfect size. 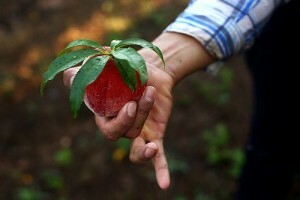 I can sell all of these I can grow.” They’re the same variety, the same color and the same taste. But Americans love their peaches the way they love their pickups: big. 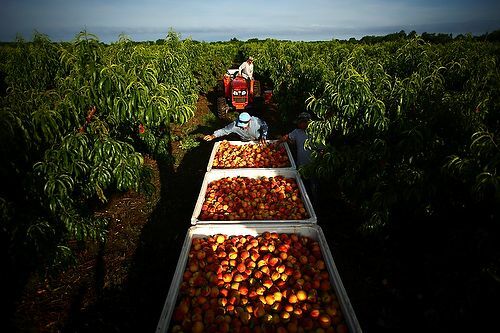 Over to the west — or perhaps the east, it’s hard to remain oriented amid acres of peach and pecan trees — Will McGehee (’98) is at the packing plant negotiating a different challenge: getting the fruits of Lawton’s labor out the door so they arrive in stores fast and consumers’ cobblers fresh. Cousins Lawton Pearson ('99) and Will McGehee ('98) enjoy the fruits of their labor. Cousins Pearson and McGehee are the fifth-generation to take the reins at Pearson Farm, a family business that’s sprawled across Fort Valley in Peach County, Georgia, about 100 miles south of Atlanta. On the Fort Valley plateau, where perfect soil and consistently favorable climate produce sweet peaches and meaty pecans, they are farming the same land their ancestors have farmed since 1888. 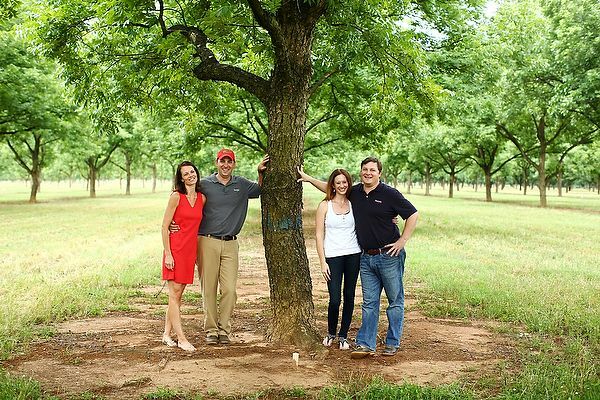 As peaches and pecans pair well together — they thrive in similar growing conditions while one bears in the summer and the other courteously waits until fall — Lawton and Will bring complementary talents and ideas to the business as it adapts to changing times. Lawton, the tall blond farmer in jeans, muddy work shoes and a baseball cap, completed law school at the University of Georgia and is the horticultural expert, overseeing planting, growing and harvesting. He has what Will calls “the gift” for knowing when it’s time to pick — and the ability to convince doubters that he’s right. 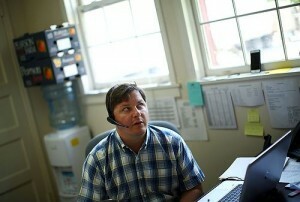 Will, a business major, left Atlanta after 10 years in the wine industry to return to Pearson Farm in 2008. As comfortable in shorts and flip-flops as he is in executive attire, he has dark hair and an engaging smile to complement his marketer’s mind and entrepreneur’s tenacity. He is owner of Genuine Georgia Group, overseeing Pearson’s sales, packing and brand awareness. With Lawton’s knowledge of responsible farming and Will’s implementation of a new business model — farm-to-fork instead of farm-to-broker — this farm is thriving when many are struggling, even gone. Retail giants like Whole Foods and Kroger, as well as famed restaurants including The French Laundry, are embracing not only Pearson’s products but also the family’s story. "I wanted to choose the farm; I didn't want the farm to choose me. I would make the same choice again." Growing up, Al and his sisters, Ann and Peggy, worked in the peach packing shed every summer, learning perseverance and tenacity. After college Al joined his father in the family business and in 1973 began operating the farm as Big 6 Farm, a partnership with his sisters that lasted for 35 years until he and Lawton began farming together. Al is married to Mary McLennan Pearson, Lawton’s mother. Will’s mother, Ann Pearson McGehee, is married to Bill McGehee, who once ran packing and sales at Pearson and remains active in Genuine Georgia Group. 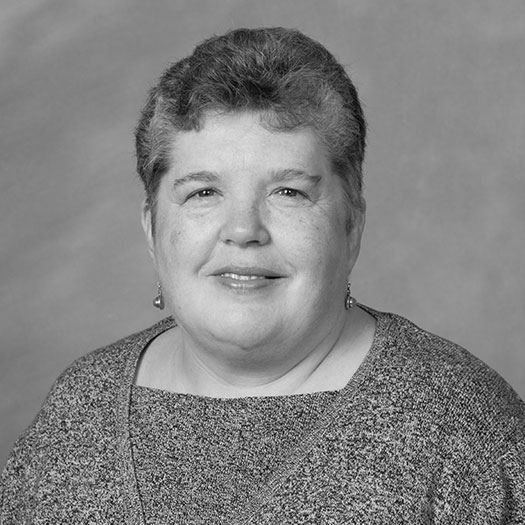 Will’s sister, Lanier McGehee Kelley, is operations manager at the packing plant, which has 35 fulltime employees. 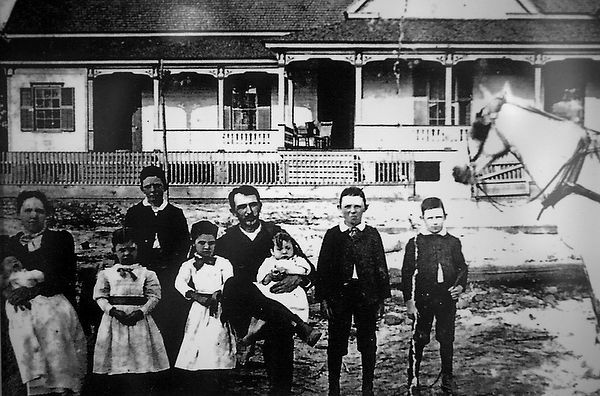 The Pearson family carries on a farming tradition begun by ancestors Moses Winlock Pearson and Emma Pearson. Emma was an astute businesswoman, keeping a list of all the mules she purchased that included their names and how much she paid for each. After high school Will, who along with his father was a huge Georgia Tech fan, wanted to leave all those Georgia Bulldogs behind. He was looking for an ACC school so he made the trip to Tobacco Road, visiting Duke, UNC and Wake Forest. When he saw Wake’s beautiful campus, he felt like he was home; the academic reputation was stellar, classes were small. And there was that aroma of a pig smoking on the grill at a fraternity house. Will appreciates good food, and if you’re lucky enough to taste his mom’s barbecue sliders or peach enchiladas you understand why. 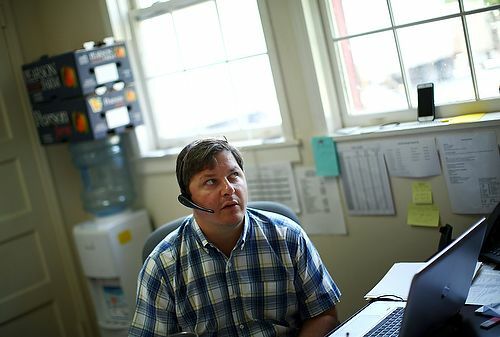 A headset is Will’s signature accessory when he’s at the packing shed. 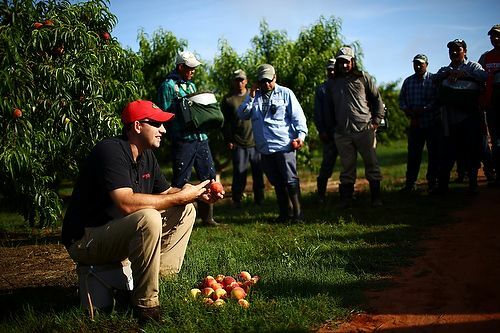 Lawton’s days are spent in the orchards, tasting peaches and teaching pickers how to know when the time is right. 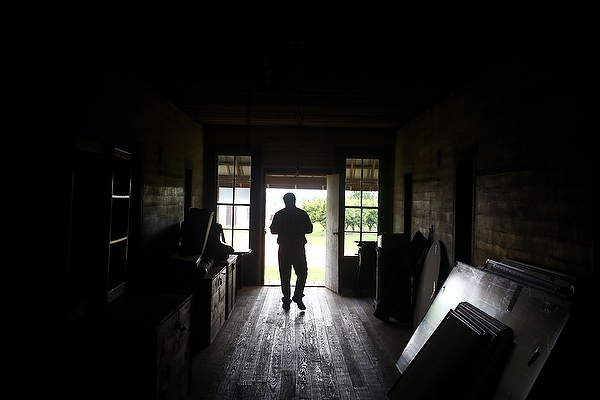 "The farm has been here for 130 years, and you don't live like you did it. It keeps you grounded." At the Lee Pope House (along with Zenith House the two original houses on the family homeplace), rockers are rocking on the white wraparound porch and the American flag is gently waving in the breeze. The home, renovated and redecorated by Ann Pearson McGehee, has charming touches like peach Bellini hand soap and a double G (for Genuine Georgia) monogrammed on the shower curtain. The walls and shelves display family photos and mementos such as quilts and heirloom china. Will and his family invite guests and potential customers to this very house and the land it sits upon to experience firsthand the Pearson story. He shows them the structure next door, known as “The Hotel,” which housed peach pickers in the early days. Among its family treasures are handwritten checks signed by his great-great-grandmother, Emma Pearson, and an itemized list of all the mules she purchased, how much she paid for each one — and their names. Handwritten messages are scrawled on the walls of the bunkrooms, several from pickers who say they’re glad to be going home. Will is renovating the hotel with plans to one day host gala events, such as a “cook-in” featuring some of Atlanta’s finest chefs. Across the road is an experimental orchard of varieties, many grown on the West Coast, to see how well they grow on the Fort Valley plateau. The cousins want more people in the East and Midwest to get their peaches fresh from Georgia, not shipped cross-country from California. “Our advantage is 3,000 miles and taste,” says Lawton. Beside the house is an heirloom garden where they’re reviving old-time varieties like Redglobe, Loring and the Pearson-Berta, a family-invented “old school” yellow peach that lacks blush color but by all accounts is the tastiest peach you’ll ever have. A family gathering: Out front are sixth-generation children Cort Pearson, Sutton Pearson and Sammy McGehee. 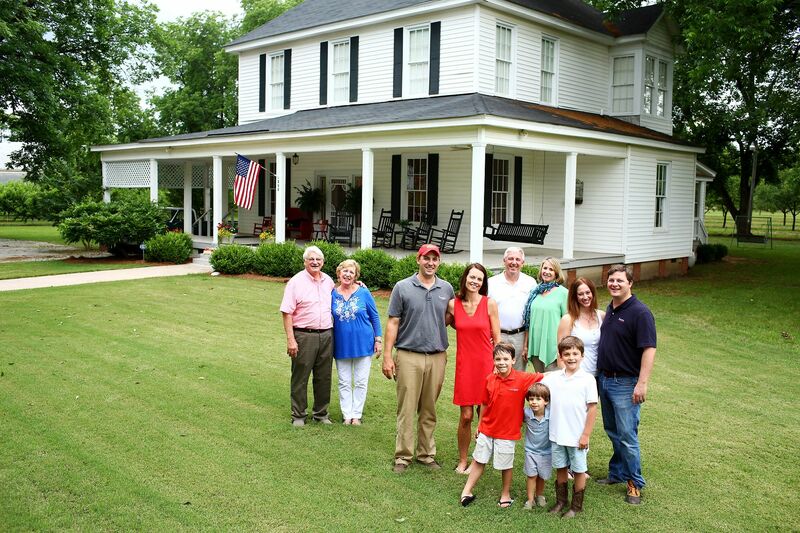 Back row (left to right) are Bill and Ann Pearson McGehee, Lawton and Lanier Defnall Pearson, Al and Mary McLennan Pearson and Will and Shannon Leonard McGehee. Not pictured are Lawton and Lanier's daughter, Adeline, and Will and Shannon's son, Hudson. The porch flag has gone from a wave to a whip as dark clouds move in to interrupt a picture-perfect day. A sudden rush of air stirs the brown Georgia dirt into a frenzy and tosses two giant ferns off their toppling stands. A shower passes through as quickly as it arrived, but not before Will comes bounding out of the orchard, grinning like a child who has just found all the Easter eggs. He’s cradling fresh-picked fruit for his signature cocktail, the Peaches McGehee. 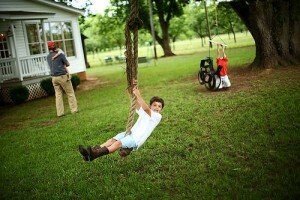 Sammy McGehee enjoys a turn on the rope swing at the Pearson family homeplace, the Lee Pope House. Shannon Leonard McGehee (’98) first caught Will’s eye in astronomy class. He didn’t know her, and she was oblivious to him. With the help of a classmate he found out Shannon’s name and left a voice message on her answering machine, asking her to a Kappa Alpha rush dance. “I listened to the message and it was the most Southern voice I’d ever heard,” says Shannon, doing her best imitation of Will’s drawl. Even though she grew up in Winston-Salem — her father is 2003 men’s basketball Hall of Famer Bob Leonard (’66, JD ’70, P ’96, ’98, ’00) — she spent substantial time with her New York grandmother and was unaccustomed to a “Southern” accent. The blind-date invitation evidently exuded sufficient charm and intrigue because Shannon borrowed a dress from her roommate and accompanied Will to the dance. “Since that first date we’ve never been apart,” he says. Married in 2001, they are the parents of two sons, Hudson Moses (named after his great-great-great-grandfather) and Samuel “Sammy” Bain McGehee. Lanier Defnall Pearson (’00), from Georgia herself, met and dated Lawton at Wake Forest; they were pretty serious. But after college they chose divergent paths — he to law school and world travel, she to Boston College for a master’s in developmental psychology. The flame smoldered, though, and when they reunited years later it was for a lifetime. They married in 2004 and have three children: Adeline Lanier (named after Lawton’s great-great grandmother), Alfred Lawton IV (“Cort”) and Sutton Hays. “She’s remarkable,” says Lawton of Lanier. Wake Forest alumni down on the farm are, left to right, Lanier Defnall Pearson ('00), Lawton Pearson ('99), Shannon Leonard McGehee ('98) and Will McGehee ('98). Being married to husbands in the agriculture business is a challenge, especially during the monthslong peach season, which the Pearson women compare to a runaway train. The days are long and the stress unavoidable. (In pecan season the pace slows somewhat since pecans are “shaken” off trees by machine, not hand-harvested.) Both families live in nearby Perry, population about 14,000. While Lanier was accustomed to small-town life, Shannon is still adjusting. They respect the fact that farming is in the Pearson blood and savor their role in raising generation six of a family with deep roots and strong values. Their children, playing catch in the homeplace yard, already have Georgia dirt — the soil that may one day provide their livelihood — on their shoes. Will walks through "The Hotel," the original living quarters for peach-pickers back in the days of his ancestors. His joy is bringing the historic structure back to life. As he handles the big blue pickup with ease Lawton notes that a long and low El Camino might be better suited for cruising between rows of peach trees. The farmer with the law degree is thinking about what he needs to plant now to ensure peach and pecan crops five, 20 and 50 years down the road. He’s thinking about decisions he and Will and the rest of the Pearsons will make that impact generations six, seven and beyond. And he’s thinking about how privileged he is to step up to the challenge of ensuring the farm’s future — the family’s future. After a ride through the orchards, a visit to Pearson Farm’s packing plant during peach season helped us appreciate the attention and labor that go into processing fruit once it’s harvested. From a rocking chair, while enjoying homemade peach and butter pecan ice cream, we were mesmerized by a conveyor belt transporting a never-ending stream of fresh-picked peaches past graders, who hand-sorted them for quality. 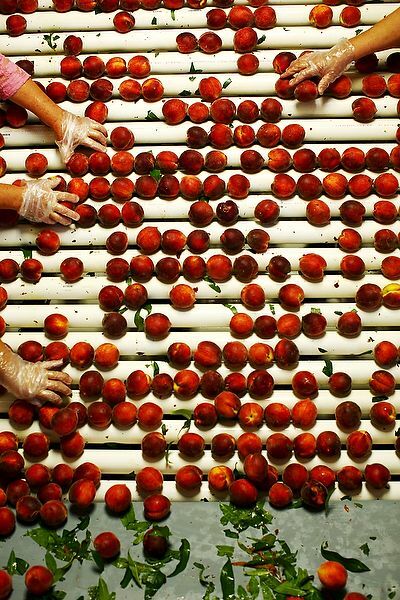 Fruit that passed their inspection continued its forward march, under a high-tech camera-like machine that determined each peach’s size, then delivered a perfect batch to waiting boxes. The peaches were packed by hand and boxes sealed before traveling to the shipping bay. 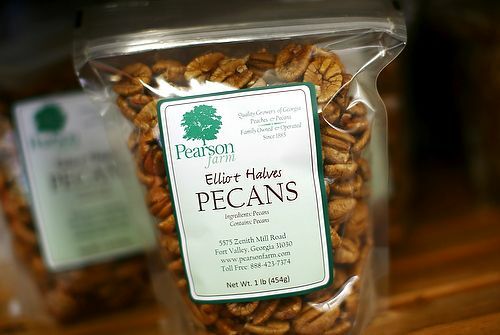 If you make the trip (or visit year-round online at pearsonfarm.com), don’t miss the assortment of pecans — including natural, sweet or spicy (Southern praline was our favorite) — plus mini peach and pecan pies made on the premises. A funeral home fan, displaying this recipe, is the sole souvenir we didn’t eat. 1. Melt stick of butter in dish in the oven. 2. Mix flour, sugar, milk and vanilla and pour over melted butter. Do not stir. 3. Spoon peaches over mixture. Do not stir. 4. Bake at 350 degrees until brown and bubbly, about 40 minutes. Serves 6.